7 July 2014. Biomedical engineers from University at Buffalo in New York developed a non-invasive technique making it possible to capture live images to diagnose and care for diseases of the small intestine. 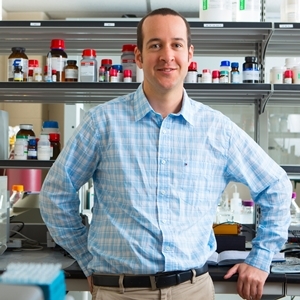 The team led by Buffalo professor Jonathan Lovell — with colleagues from Buffalo and universities in Wisconsin, Canada, and Korea — published their findings online yesterday in the journal Nature Nanotechnology (paid subscription required). The small intestine absorbs about 90 percent of all fluids and nutrients taken in, and is supported by nerves and lymphatic and blood vessels that transfer the nutrients throughout the body. Contents of the small intestine are moved through the organ with wave-like muscle contractions called peristalsis. Disorders such as irritable bowel syndrome, celiac disease, and Crohn’s disease can result the small intestine is not functioning properly. Current techniques like X-rays or ultrasound can provide images of the small intestine including blockages, but first require patients to drink a chalky barium compound. X-rays also need to be limited to prevent overexposure and ultrasound by itself does not provide adequate contrast. In addition, none of the current techniques can show peristalsis functions in real time. Thus Lovell and colleagues are seeking a non-invasive imaging method that is safe and easy to administer, yet still survives the harsh environment of the digestive tract and effectively return images showing the small intestine in action. For this purpose, the researchers adapted a dyeing compound called naphthalocyanine used in molecular imaging that helps illustrate chemical bonds between atoms and molecules. Naphthalocyanines absorb light in the near-infrared spectrum, which is not visible, but when its rays are absorbed, can act as a contrast agent to make the organ’s actions stand out. The team first needed to overcome problems with naphthalocyanines, namely their inability to disperse in liquids, so they can flow through the small intestine. Here, the researchers created nanoscale particles of naphthalocyanines they call “nanonaps” that act as micelles, particles with differing charges that enable them to disperse in fluids. Lovell and colleagues tested the technique with lab mice, which drank a nanonap solution and were submitted to photoacoustic tomography that sends lasers into a target region. The lasers generate pressure waves when striking tissue and contrast agents that can be measured with ultrasound, then recreated in real time with an algorithm. 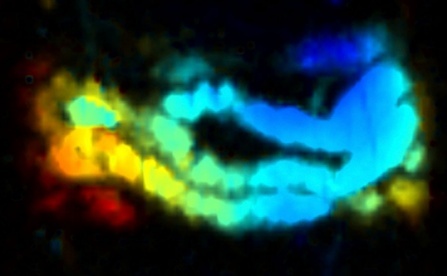 The technique, say the researchers, returns images with satisfactory resolution (see example below), while the nanonap solution passes safely through the lab mice. The team next aims to refine the technique for testing with human subjects, as well as expand its use to other gastrointestinal organs.